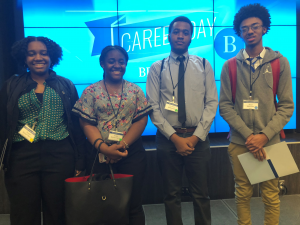 On Friday, March 15th, 2019, 5 students from our City Leaders Program (CLPS) arrived bright and early for a day of learning and one-on-one mentorship from one of the most prestigious think tanks – The Brookings Institution – a highly regarded, non-profit organization that conducts in-depth research to provide ideas to solve society’s problems at the local, national, and global levels. When we arrived to Brookings, we were greeted by their friendly staff and ushered in for breakfast. We listened to welcome remarks from their senior staff – the Deputy Chief HR Officer, April McWilliams and President, John Allen. Ms. McWilliams explained the joy and excitement the organization had for hosting the event and the hope that the students in attendance would consider interning, and in the future, working for Brookings. Mr. Allen explained what exactly what a think tank is (many were wondering), what fields and positions were available in the organization, and what they could expect to do as a part of the organization. After the welcome remarks, the students participated in a fun ice breaker to get them thinking about the possible issues they would be working with and helping them be more confident in their opinions and what they have to offer. One student expressed how the activity gave him an opportunity to discuss issues that he would not normally with is friend groups and that he gained more confidence in his ideas and capabilities.